Race may influence whether women diagnosed with breast cancer will survive, suggests a new study which found black women are more likely to die even when their tumours are found when they are small and theoretically easier to treat. The study, which is based on U.S. data, said that even when breast cancer is diagnosed at Stage 1, black women have a higher risk of dying than women of Japanese ethnicity or white women. 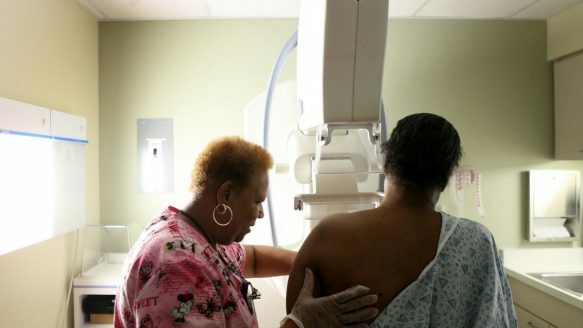 Senior author Dr. Steven Narod said it had long been thought differences in outcomes between white and black women with breast cancer related to access to quality health care in the United States, where before the Affordable Care Act came into effect more black women may have been without health insurance. But he said that by mining a large U.S. database that registers breast cancer cases by stage at diagnosis, income status, race and ethnicity, he and his colleagues concluded that isn't the case. "The assumption that we're going to eliminate differences in cancer outcomes by eliminating differences in health care is not that well founded," said Narod, a leading breast cancer researcher who is based at Toronto's Women's College Hospital. "There may be intrinsic biological differences that account for some of the differences in outcomes that cannot be eliminated." Narod said he thinks similar results would be seen if a matching study was done in Canada, but without doing the work he cannot be sure. Narod and his co-authors analyzed data on nearly 375,000 women with invasive breast cancer that was diagnosed between 2004 and 2011. The study is published in the Journal of the American Medical Association. They looked at the stage of the cancer at diagnosis, in particular focusing on women whose cancers were found at the earliest stage, when the cancers were less than two centimetres in size. With some types of breast cancer, the earlier the tumour is found the more likely it is that the woman will survive. So looking only at cancers diagnosed early should have eliminated the survival differences one might have expected to see if one racial group's problems accessing care meant their cancers were typically found later. The researchers saw that black women were less likely to be diagnosed with Stage 1 cancer than women of Japanese heritage. But even if they were first diagnosed with a Stage 1 tumour, black women were more likely to die from the cancer than white women or women of Japanese ethnicity. For one thing, the cancer was more likely to have spread at the time of diagnosis, even though the cancers were small. And black women were more likely to have the hardest form of the disease to treat, known as triple negative breast cancer. "It's more likely to have already spread when it's detected. And if it hasn't spread when it's detected, it's more likely to spread in the future. Both things are true, compared to a white woman," Narod said. An editorial that accompanied the study suggested the survival gap will only be closed when large numbers of women from minority groups are included in studies aimed at finding the genomic basis of different types of breast cancers. Editorial co-author Dr. Olufunmilayo Olopade called the paper "fundamentally important," saying she has been pressing the breast cancer research field to look at racial differences for some time. "Yes, you can talk about access (to care), said Olopade, director of the Center for Clinical Cancer Genetics at the University of Chicago Medical School. "But if you treat all cancers the same in all populations, you are not recognizing the biological differences that happen in human beings." She said the advent of registries like the one Narod and his colleagues mined finally gives researchers granular data to study. "The data are speaking to us in very different ways than we had been accustomed to because they now break everybody down by their race and their ethnicity." But Dr. Otis Brawley, chief medical officer of the American Cancer Society, suggested the differences in survival outcomes may not be down to race but rather socio-economic factors. He said girls who are born into poor families have poorer diets, are more likely to gain weight in childhood and are more likely to start menstruating early. Early start of menstruation is linked to an increased risk of breast cancer. Brawley said studies done in Scotland — in an all-white cohort — showed that women who were economically deprived in childhood had higher rates of breast cancer later in life and were more likely to develop breast cancer at a younger age than women who were more economically advantaged. He said the American Cancer Society would expect to see similar survival outcomes among poor white women as among poor black women — and even middle- and upper-income black women who grew up poor. "I believe it's race for social reasons, and not race for biologic reasons," Brawley said. "There are a lot of lifestyle factors that actually do affect biology and change biology." Olopade disputed Brawley's position, saying there are many poor Asian immigrants in the United States but their breast cancer outcomes are not on a par with those of black women. Narod said that among all racial or ethnic groups, the seven-year survival rates were good when breast cancers were detected when the tumour was under two centimetres in size. For women of Japanese heritage, the survival rate was nearly 99 per cent. For white women it was 95 per cent, and for black women it was 91 per cent, he said. "Those are all pretty good, but there's a hell of a big difference between a one per cent chance of dying and a ... nine per cent chance of dying," said Narod. "That's an extraordinary difference from that point of view."